Archaeology was institutionalized by a reification of the past into governmental branding, such as through images of Palmyra on the national currency, or school textbooks. Although Palmyrans wrote and probably spoke in Aramaic, they are frequently called ‘Arabs’ by Syrian regime historians. Joachim Neander was a 17th-century Calvinist theologian who often hiked through a valley outside Düsseldorf, Germany, writing hymns. Neander understood everything around him as a manifestation of the Lord’s will and work. There was no room in his worldview for randomness, only purpose and praise. The first fossilised dinosaur brain has been found on a beach in East Sussex and could show that the extinct giants were more intelligent than first thought. The small brown pebble was spotted by amateur fossil hunter Jamie Hiscocks on the coastline near Bexhill-on-Sea. About the project They steal our files, corrupt our hard drives and destroy our lives. We scan. We block. Do everything we can to prevent infection. Computer viruses. We hate 'em. Nevertheless, we remain fascinated by their evil plots. Anyone who can read German can read the first book ever printed. If you can read Sumerian cuneiform, you can read clay tablets that were probably the first things ever written. Hard copy sticks around, equally a delight to scholars and a burden to office managers. More significantly, the read-out system - the human eye, hand, and brain for which the scribes of Sumer scratched in clay - has not changed appreciably, which is why nearly every written thing that survives, from the dawn of writing to yesterday's newspaper, is still accessible and constitutes a fragment of civilization. But as we move forward we discover that not all modern means of storing data share the characteristic of eternal readability. This problem originally appeared in the pre-electronic age, with the invention of sound recording. Signals were embodied in an object that required a specific machine to render it back into a form that could be apprehended by the senses. In those days, there were dozens of incompatible recording formats. The 10-inch, 78-rpm shellac platter ultimately won out, but not before the losers had produced a substantial body of recorded material, some of it irreplaceable. Serious audiophiles constructed customized machines that could play anything from Edison cylinders to the various platter formats - including those that ran from the axis to the circumference - to the standard outside-in disk. When LPs were introduced, turntable manufacturers included variable-speed switches, so you could play your old 45s as well as the new "albums." That was a slower era, of course, when decades passed between one standard and another. But the advent of digital computing in the early '50s vastly accelerated the pace at which we replace formats designed to store information. With computers increasing an order of magnitude in speed every two or three years, at the same time decreasing in cost, the pressure to dump the old, less efficient standards was irresistible. Obviously, much of the data stored on the old systems - the material of immediate or archival value to the organization doing the replacement - is recorded in the new format and lives on. But a lot of it doesn't. Digital archaeology is a discipline that doesn't quite exist yet, but may develop to deal with this problem, which is pervasive in the world of data. NASA, for example, has huge quantities of information sent back from space missions in the 1960s stored on deteriorating magnetic tape, in formats designed for computers that were obsolete twenty years ago. NASA didn't have the funds to transfer the data before the machines became junk. The National Center for Atmospheric research has "thousands of terabits" of data on aging media that will probably never be updated because it would take a century to do it. The archival tapes of Doug Engelbart's Augment project - an important part of the history of computing - are decaying in a St. Louis warehouse. "The 'aging of the archives' issue isn't trivial," says desktop publisher Ari Davidow. "We're thinking of CD-ROM as a semi-permanent medium, but it isn't. We already have PageMaker files that are useless." Also, recall that the PC era is an eye-blink compared to the mainframe generations that came and went under the care of the old Egyptian priesthood of computer geeks. (Would you believe a '60s vintage GE 225 machine that ran tapes that stored 256 bits per inch? Drop some developer on it and you can actually see the bits.) J. Paul Holbrook, technical services manager for CICNet (one such Egyptian priest), summarizes the problem this way: "The biggest challenge posed by systems like this is the sheer volume of information saved - there's too much stuff, it isn't indexed when it's saved, so there's lots of stuff you could never discover without loading it up again - that is, if you could load it up. "The nature of the technology makes saving it all a daunting task. It's certainly possible to keep information moving forward indefinitely, if you keep upgrading it as you go along. But given the volume of data and how fast it's growing, this could present an enormous challenge." Holbrook says twenty years is the maximum time you can expect to maintain a form of digital data without converting it to a newer format. He draws an analogy to print: "What if all your books had only a twenty-year life span before you had to make copies of them?" A 'museum of information,' suggested by WELL info-maven Hank Roberts, might help to stem the leakage. Roberts says, "[Museum] collections are spotty and odd sometimes, because whenever people went out to look for anything, they brought back 'everything else interesting.' And that's the only way to do it, because it always costs too much to get info on demand - a library makes everything available and throws out old stuff; a museum has lots of stuff tucked away as a gift to the future." Visiting Jon Thompson and Alison Craighead’s survey exhibition, Never Odd Or Even, currently on show at Carroll / Fletcher Gallery, I found myself confronted with an enigma. How to assemble a single vision of a body of work, impelled only by the dislocated narratives it offers me? ‘Archaeology’ is derived from the Greek word, arche, meaning ‘beginning’ or ‘origin’. The principle that makes a thing possible, but which in itself may remain elusive, unquantifiable, or utterly impervious to analysis. And so it is we search art for an origin, for an arising revelation, knowing full well that meaning is not something we can pin down. Believing, that the arche of a great work is always just about to take place. In an essay written especially for the exhibition, David Auerbach foregrounds Thompson and Craighead’s work in the overlap between “the quotidian and the global” characteristic of our hyperconnected contemporary culture. Hinged on “the tantalising impossibility of seeing the entire world at once clearly and distinctly”  Never Odd Or Even is an exhibition whose origins are explicitly here and everywhere, both now and anywhen. The Time Machine in Alphabetical Order (2010), a video work projected at the heart of the show, offers a compelling example of this. Transposing the 1960 film (directed by George Pal) into the alphabetical order of each word spoken, narrative time is circumvented, allowing the viewer to revel instead in the logic of the database. The dramatic arcs of individual scenes are replaced by alphabetic frames. Short staccato repetitions of the word ‘a’ or ‘you’ drive the film onwards, and with each new word comes a chance for the database to rewind. Words with greater significance such as ‘laws’, ‘life’, ‘man’ or ‘Morlocks’ cause new clusters of meaning to blossom. Scenes taut with tension and activity under a ‘normal’ viewing feel quiet, slow and tedious next to the repetitive progressions of single words propelled through alphabetic time. In the alphabetic version of the film it is scenes with a heavier focus on dialogue that stand out as pure activity, recurring again and again as the 96 minute 55 second long algorithm has its way with the audience. Regular sites of meaning become backdrop structures, thrusting forward a logic inherent in language which has no apparent bearing on narrative content. The work is reminiscent of Christian Marclay’s The Clock, also produced in 2010. 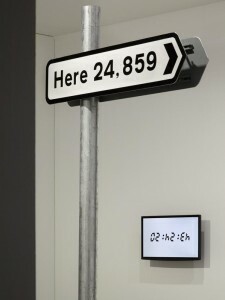 A 24 hour long collage of scenes from cinema in which ‘real time’ is represented or alluded to simultaneously on screen. But whereas The Clock’s emphasis on cinema as a formal history grounds the work in narrative sequence, Thomson and Craighead’s work insists that the ground is infinitely malleable and should be called into question. Never Odd Or Even features a series of works that play more explicitly with the internet, including London Wall W1W (2013), a regularly updated wall of tweets sent from within a mile of the gallery. This vision of the “quotidian” out of the “global” suffers once you realise that twitter monikers have been replaced with each tweeter’s real name. Far from rooting the ethereal tweets to ‘real’ people and their geographic vicinity the work paradoxically distances Thomson and Craighead from the very thing twitter already has in abundance: personality. In a most appropriate coincidence I found myself confronted with my own tweet, sent some weeks earlier from a nearby library. My moment of procrastination was now a heavily stylised, neutralised interjection into Carroll / Fletcher gallery. Set against a sea of thoughts about the death of Margaret Thatcher, how brilliant cannabis is, or what someone deserved for lunch I felt the opposite of integration in a work. In past instances of London Wall, including one at Furtherfield gallery, tweeters have been contacted directly, allowing them to visit their tweet in its new context. A gesture which as well as bringing to light the personal reality of twitter and tweeters no doubt created a further flux of geotagged internet traffic. Another work, shown in tandem with London Wall W1W, is More Songs of Innocence and of Experience (2012). Here the kitsch backdrop of karaoke is offered as a way to poetically engage with SPAM emails. But rather than invite me in the work felt sculptural, cold and imposing. Blowing carefully on the attached microphone evoked no response. The perception and technical malleability of time is a central theme of the show. Both, Flipped Clock (2009), a digital wall clock reprogrammed to display alternate configurations of a liquid crystal display, and Trooper (1998), a single channel news report of a violent arrest, looped with increasing rapidity, uproot the viewer from a state of temporal nonchalance. A switch between time and synchronicity, between actual meaning and the human impetus for meaning, plays out in a multi-channel video work Several Interruptions (2009). A series of disparate videos, no doubt gleaned from YouTube, show people holding their breath underwater. Facial expressions blossom from calm to palpable terror as each series of underwater portraits are held in synchrony. As the divers all finally pull up for breath the sequence switches. Fossils and artefacts pulled from the Grotte du Renne cave in central France present anthropologists with a Pleistocene puzzle. Strewn among the remains of prehistoric mammals are the bones of Neanderthals, along with bladelets, bone points and body ornaments belonging to what archaeologists call the Châtelperronian culture. Such complex artefacts are often attributed to modern humans, but a new report in the Proceedings of the National Academy of Sciences suggests that Neanderthals created the objects in imitation of their Homo sapiens neighbors1. How the Grotte du Renne deposit formed has important implications for how we view our extinct sister species. If Neanderthals left the assemblage, then they were capable of a degree of symbolic behaviour thought to be unique to humans. Why look at animated GIFs now? They are one of the first forms of image native to computer networks making them charmingly passé, a characteristic that gives them contradictory longevity. Animated GIFs crystallise a form of the combination of computing and the camera. As photography moves almost entirely into digital modes, the fascination with such quirky formats increases. The story of photography will be, in no small part, that of its file formats, the kinds of compression and storage it undergoes, as they in turn produce what is conjurable as an image. The Graphics Interchange Format was first developed through the computer network firm Compuserve. As an eight-bit file format it introduced the amazing spectacle of 256 colour images to be won over the thin lines of dial-up connections. Due to this, when a picture is converted to GIF, it’s likely that posterization occurs – where gradations of tone turn to patches of reduced numbers of colours. Such aliasing introduces a key part of their aesthetic, something described by the Lempel-Ziv-Welch (LZW) compression that lies at the format’s core. Characteristic of images in the present era its history is entangled with the imaginings and instruments of “intellectual property”. The LZW format was itself the site for a protracted and infamous attempt at patent enforcement in the USA that dragged on from 1994 until 2003 prompting the rapid development of the alternative PNG format. To what extent do the material components (e.g. hardware, source code, network protocols) and properties (e.g. speed, malleability, erasability) of digital technology influence the methodologies one might employ to study it? Is there a specific “ethnographic toolkit” that is particularly well-suited for studying the digital form and related socio-cultural phenomena? 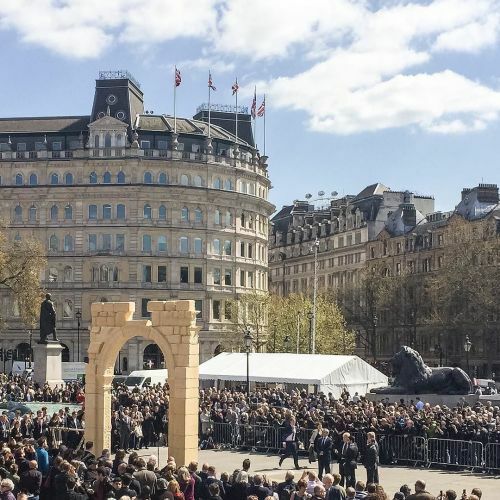 "We're trying to work out whether places have memories and if so, how can we help people relate to these memories," says Tim Cole, a lecturer in History at the University of Bristol. His project, Reflecting the Past, will see augmented reality mirrors deployed in the saloon of the ship, SS Britain, to allow visitors to "glimpse characters from the past in a fragmentary, fleeting kind of way". When in situ in September, the content will not be triggered by the visitor but played on a random loop, he adds. "Sometimes you'll see things and sometimes you won't. We want to emphasise the view that the past isn't easy to get at. The past leaves it traces but they're not there on demand in the present." I'm looking for 'Folk' Web Cultures. I am thinking of the recent take-down of Geocities, which seemed to refresh people's love of the naff, kitsch aesthetic it was famous for, as a prime example. What are some other folk cultures still lingering in the dark corners of the web? I use the term 'Folk' in the sense it is used to denote 'common people' cultures, including art, music, dance, songs and stories. The artists Jeremy Deller and Alan Kane collated a Folk Archive for the British Council a few years ago, it really gets to the heart of my use of the term. What is, and where can I find, the Folk Web? What websites and archives have devoted themselves to highlighting and saving these cultures? Do you know any examples of writers, artists, designers who have been influenced, or abused a Folk Web culture in their contemporary work? Image spam is one of the many dark matters of the digital world; spam tries to avoid detection by filters by presenting its message as an image file. An inordinate amount of these images floats around the globe, desperately vying for human attention.2 They advertise pharmaceuticals, replica items, body enhancements, penny stocks, and degrees. According to the pictures dispersed via image spam, humanity consists of scantily dressed degree-holders with jolly smiles enhanced by orthodontic braces.